Remember when we all thought Frasier Crane's brother Niles' worry after every potential germ in his midst seemed so so ridiculous? 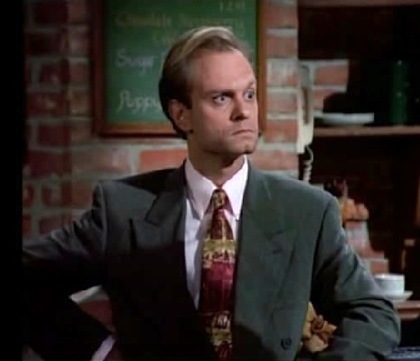 How we laughed every time the character, brought to life by the brilliant actor David Hyde Pierce, took out his hanky and wiped a chair before before sitting on it? How he used the same hanky to protect his skin from anything that may have come in contact with another human being? How fastidious he was about refusing to touch objects that were in the public domain? Anything he assumed was sullied by another person's touch or animal fur? Watching reruns of Frasier, I realize today Niles' actions would not be considered all *that* crazy in light of all we're doing to be germ-free and non-contagious. I'm sure he and Daphne went on to live long and healthy lives with however many children they had because of his hygiene. With the advent of Swine and other types of dire flu warnings, gel germ killer containers are everywhere: grocery, clothing and department stores, rest rooms and more, since the best way to prevent catching any of them is washing or de-germing our hands. Or both. We're not seen as "round the twist" if we use rubber or latex gloves to protect ourselves from bacteria, viruses, fungi or protozoa that can cause our vulnerable bodily vessels to become diseased, especially to read books from the library - which can be havens for germs! From the looks I receive as my gloves and I peruse the bookshelves, I realize, as always, I'm a little ahead of the hygienic cultural curve; but trust me, wearing gloves at the library will catch on soon. Even the once comically fastidious Mr. Monk (Tony Shalhoub) begins to look normal, his program seen as a docu-drama these days rather than a comedy. I can't because I'm allergic. But I bathe in Purell at every turn, especially when someone glances in my direction. Never can tell if they're exhaling when they face me. I use the type that's kind to your skin; the other stuff is too drying.